Football/Soccer Session (Moderate): 'See the pass - give the pass' - Bangor City Academy U12s . 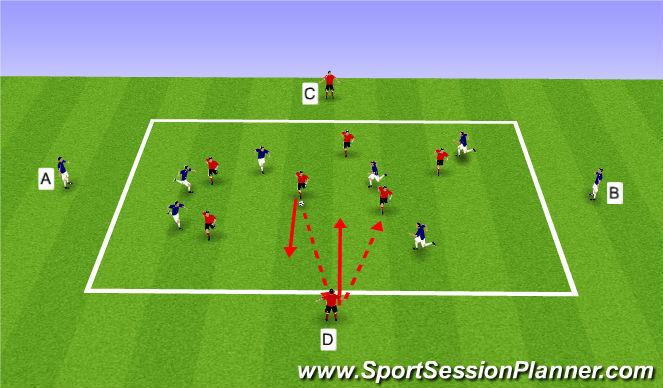 . .
decision making and technical aspects of passing and recieving the ball . . . 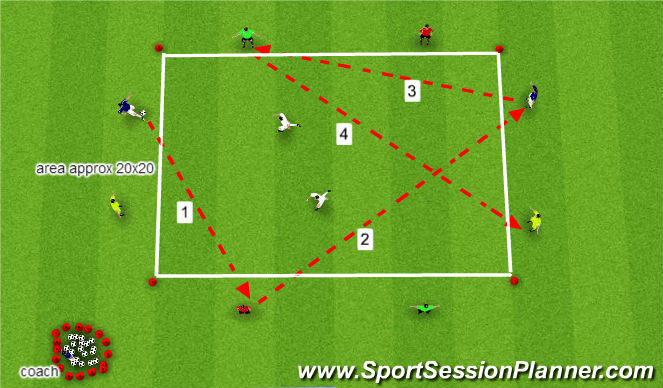 PRACTICE 1 - 10 plrs involved working in pairs with one pair inside the area and the others situated around outside of area &apos;object of the game is simply for plrs on the outside to maintain possesion of the ball and not allow plrs inside area possesion. GAME STRUCTURE - as stated above object of game is for plrs on the outside to keep possesion of the ball and obtain a high level of passing techniques in &apos;seeing the pass and giving the pass&apos; the aim/goal for central/inside pairing is to gain possesion by intercepting the ball/pass and on doing so they can exchange places with whichever pair/team who give away possession . .
TEMPO OF SESSION - it is vital that a high tempo is maintained throughout in both the passing and concentration displayed by plrs . . AIMS - to observe plrs displaying correct decision making and correct techniqes in passing and recieving the ball also to challenge plrs throughout the session . . .
Oganise are of approx 40X40yds with two teams of 8 reds and 8 blues the practice involves a blue plr at each end of the pitch plr A & plr B with 6 blues in central area the red team also have two plrs on outside plr C & plr D they also have 6 plrs in central area. The objective for teams is to pass to plr on outside and s/he on their first touch enter the pitch and the plr who passed to them take their place on the outside (this will ensure rotation of plrs) if blue team gain possession they will try and score by passing to their outside plrs and mirror image the rotation process, so the game constantly changes and this will improve decision making and awareness among plrs. Achieve end-end within only 3 passes.